SIMA School Via Omboni 7, near C.so Buenos Aires 0292807017 More info? Decontracting MassageCourse in Milan is specific to adress pain, posture problems, stress related pain, muscole pain and sport traumas. You will learn the relaxing and immediately effective Ayurvedic Touch Method. According to Ayurveda, massage is a fundamental wellness practice, to be received whenever possible. And so do we, at SIMA! Back and muscle pain are very common, and with this course you will be able to give immediate relief. Ayurvedic Touch massage is sweet and soothing, and can be practicesd withot fear of harming or worsen the pain condition. 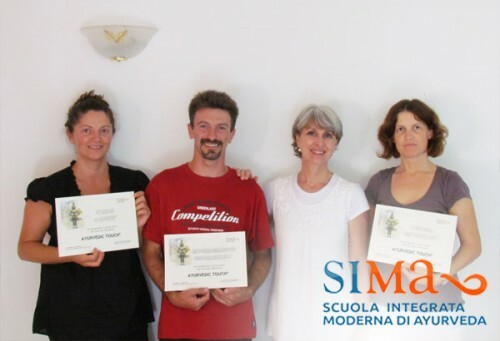 Decontracting Massage Course is held at SIMA, inside Spazio SoloSalute®, Via Omboni 7 near Piazza Lavater, across Corso Buenos Aires near Porta Venezia, Milan. Be our gest in our beautiful wellness center, built according to bio architecture, decorated with and essential yet informal style, to make you feel at ease. Course lasts one day, usually on saturday, from 10AM to 6PM; timings may vary according to the number of participants. Specific course can be held individually as well; in this case, schedule and timings will bediscussed personally with teachers.